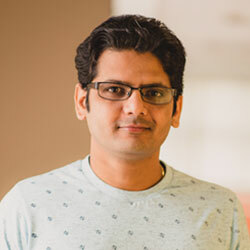 Deepak manages global programs at Saviant. Using the ‘What’s in it for him/her’ approach, Deepak consults clients on their Digital Transformation journey, with Artificial Intelligence & cross-platform applications. With empathy and curiosity, he empowers his customers, project teams and his solutions for the desired success. Deepak’s journey of 11 years in the IT Industry has made him an expert with Construction, Logistics, Travel and Public-Sector Domains. Prior to Saviant, he worked with Deloitte Consulting wherein he was placed at Washington DC as an onsite consultant. He spearheaded project planning, design, scope and delivery for Human & Health Section for the US Public Sector. He managed teams as the offshore project manager as well. He has an Electronics Engineering Degree from Government College of Engineering, Nagpur, India. Deepak is a fitness enthusiast and indulges in Sports and movies leisurely.